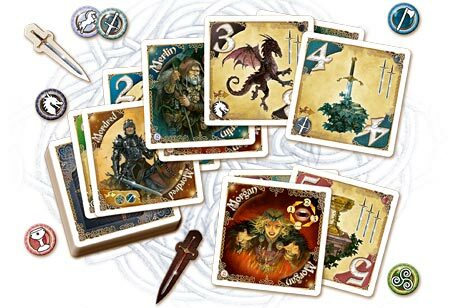 Shadows over Camelot – The Card Game follows in the footsteps of the original award-winning cooperative board game. As the sons & daughters of the legendary Knights of the Round Table, players work together to defend Camelot and defeat the game’s threats, represented by a deck of Rumor cards that swirl around the kingdom. Once again, the Knights face Traitors in their midst as loyalties are tested… Using totally different mechanics from its board game namesake, the card game nonetheless recaptures all the epic tension and backstabbing treachery of its glorious predecessor! Ticket to Ride – the Halloween Freighter is a new set of custom-sculpted trains and stations which includes 45 new orange-colored Pumpkin Trains and 3 spooky Halloween Stations. 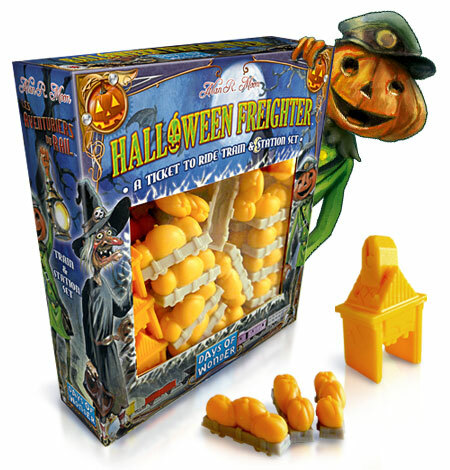 It’s a Halloween treat for Ticket to Ride fans worldwide that can be used as a replacement train set for any Ticket to Ride game or map collection. 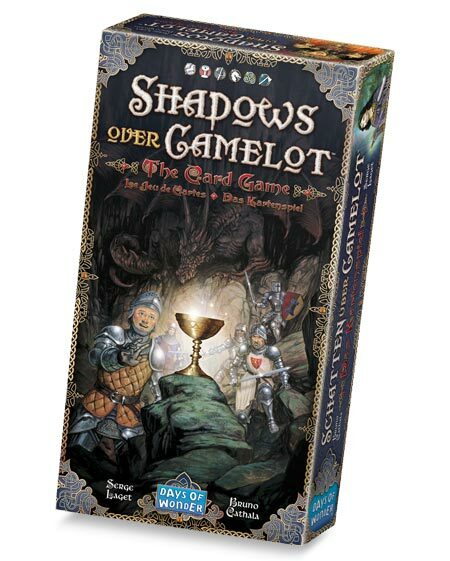 Shadows over Camelot – The Card Game is a stand-alone game that takes approximately 20 minutes and can be played with 2-7 players, as well as solo. It will be available in mid-October at the Essen Spiel and in game stores in Europe and North America in late October. The Halloween Freighter limited edition Train & Station Set will also be at Essen and is expected in game stores in North America and from the Days of Wonder webstore during Halloween week; and in Europe in early November. You can order the card game; Train Set or both from the Days of Wonder webstore. Note: Ordering both products together will save on shipping costs, but will not ship until both are available. This entry was posted on Thursday, October 4th, 2012 at 12:20 and is filed under Events, Games, News, Shadows over Camelot, Ticket to Ride. You can follow any responses to this entry through the RSS 2.0 feed. Both comments and pings are currently closed.